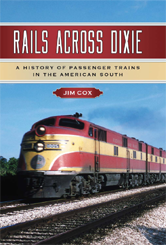 The book explores the technological achievements, the romance and the economic impact of traveling on the tracks. Other topics include contemporary museums and excursion trains; the development of commuter rails, monorails, light rails, and other intracity transit trains; the social impact of train travel; and historical rail terminals and facilities. The book is supplemented with more than 160 images and 10 appendices.